When I started to get to know my husband’s family, I realized that I would become the family crocheter. His grandmother had done it before, and had crocheted the family all kinds of gifts, slippers and hats – she even crocheted a blanked for him (or his mother) to give to the woman who would become his wife (me). It’s quite precious. 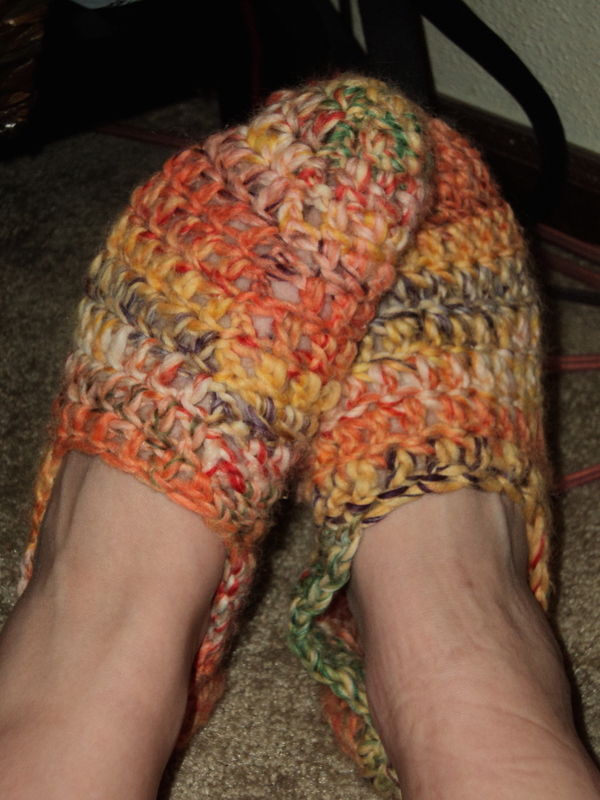 There is one pair left of the slippers she’d make; my MOH has it. A few summers ago, I looked at it closely to be able to reverse-engineer the process, but my attempts have been unsuccessful. As it’s November and I hate socks, (I don’t actually hate them; they just really hurt to put on) I still want something to put on my feet to keep warm. Also, I want to be able to make something for the family since Grandma is no longer doing it. 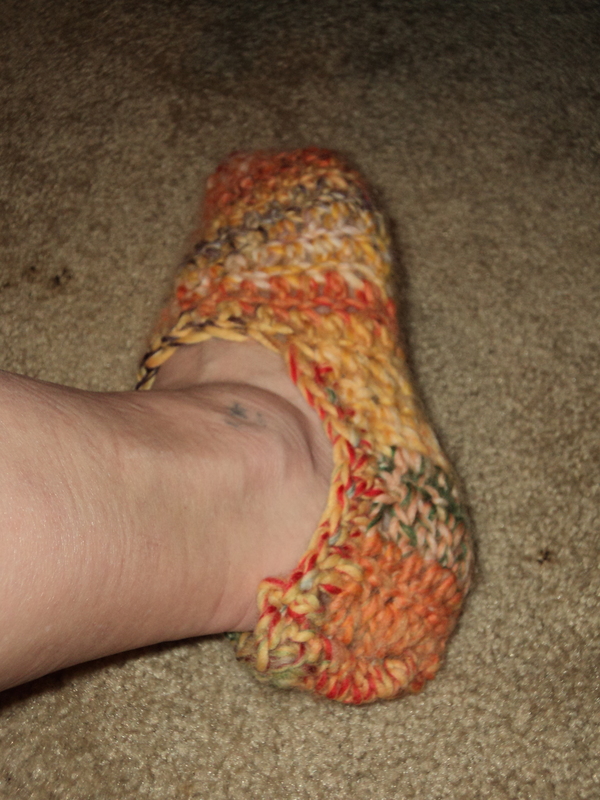 I found a simple slipper pattern on this website, and am quite please with the result of my own efforts. It’s simply a double stitch, but it’s much tighter (read: warmer) than my original efforts had been, and simpler, too! 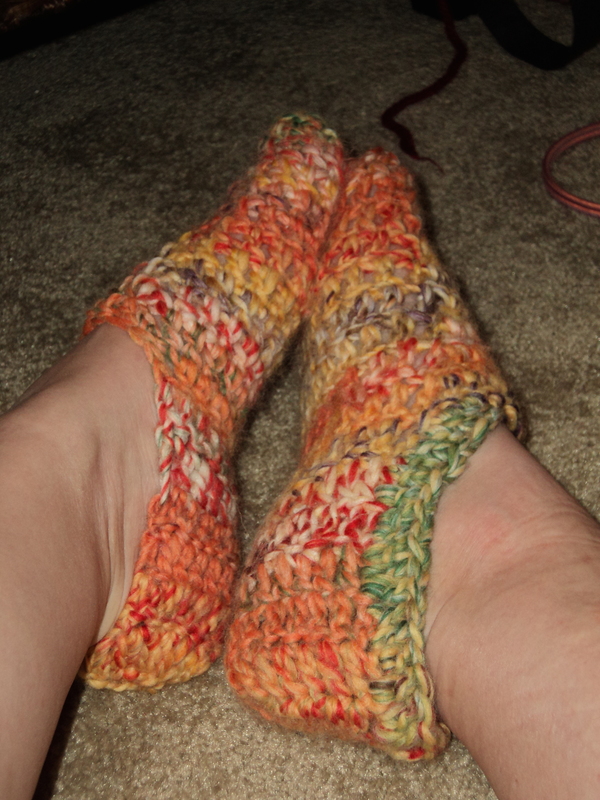 I adapted it a bit to fit my feet, which I guess are smaller than I anticipated. I started with a chain of 4, slip knot into final loop. Chain three, and then two double stitch into each loop except for the last one, I only put one. Join together with slipknot and then chain three more. Alternate one double stitch and two double stitch into each loop. When reach the end, join them together. Chain three. Put one double stitch into each loop. Join the chain with the final stitch. Repeat until you make it as far down your foot as you want. Then, chain three, and put a double stitch in each loop about as far as you want it to go around the bottom of your foot. Repeat until it covers your foot. Stitch the two ends together and enjoy! Now I can make some for the rest of the family! What do you think? Do you have a pattern you like? Did you try this one? You know, I think I love it, too. My family of origin isn’t really one that has a lot, but we (or I, at least) treasure the ones we have. My husband’s family, on the other hand, really values their traditions and intergenerational pass-downs. I think it’s really cute (not to sound patronizing) and I’m honored that they include me in it. Now we’re getting technical! Is it my mind that made me think the first photograph was a pair of Bermuda Shorts? Anyway, nice pattern. I think I’d be proud to have those (for my wife, of course). Thank you! 🙂 Mmmm – Bermuda….